Bringing Fido along on a trip can be fun, exciting and memorable, but also a challenge when it comes to bathroom etiquette. If you’re planning to travel with your dog, embrace the benefits, but also plan for a successful, stress-free vacation by helping your dog stay house-trained on-the-go. If you’re wondering whether to leave your pet homebound because you’re worried about his potty manners, we’ve got tips and tricks on how to make a long trip or a short weekend less ruff. Summer is the busiest season for travel, with recent pet trends encouragingadventurous owners to bring their four-legged friends along for the ride. Unfortunately, even the most perfectly house-trained dogs who find themselves in unfamiliar settings may treat new places, like a hotel room or friend’s house, as an acceptable place to use the bathroom indoors, simply because it doesn’t smell like home. Disposable dog training pads can be a lifesaver when your faithful companion is having a bit of trouble “going” in places which aren’t appropriate. Dogs don’t just eliminate out of need, but also as a way to mark their territory. When your dog is sniffing around for what seems like ages, it’s because he is seeking out the perfect place where his “information” is sure to be noticed by other canine visitors. A dog’s house-training may or may not travel with him to a new destination. Dogs tend to learn where the proper toilet locations are at home and the places they visit regularly. But, they may not know when you first step out into a different location. Teaching your dog to go number 1 and number 2 on a variety of surfaces such as grass, cement, woodchips, gravel and rocks will help your pooch handle trips with ease. It may be a bit of a challenge in the beginning to accustom your pet to eliminate somewhere other than a place they’re familiar with, but using a code word in the training process (like “go potty”) can help initiate quicker pit stops down the road so you’re not waiting it out. But if your dog requires more time, be patient. 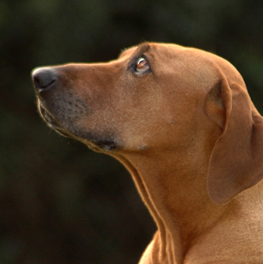 Over the course of a week or two, when you notice your dog is about eliminate, say your cue. This will help to create an association between the word and the action of peeing and pooping. Always reward your furry friend or praise them afterwards to strengthen the memory. When your dog seems to be grasping the connection between the command word and using the bathroom, begin asking your pup to “go potty” when you know he needs to, but hasn’t yet. Keep rewarding your dog until he becomes successful. Now when you get to a new place you can take your dog to an appropriate area and expect them to go when asked. 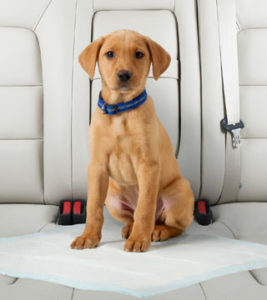 On long trips, especially during flying, where you can’t exactly pull over for a break, dog pads are immensely useful. While some airports have a designated relief area for companion animals, many do not. And asking your dog to hold it for eight hours or more can be difficult. Placing and using a pad in unconventional places such as in the corner of the airport, on the floor inside a restroom stall, or even in the bathroom within the cabin of a plane can ensure quick clean up and help avoid accidents when used along with your dog’s cue word. Whether you’re checking in to a pet-friendly hotel or spending the night with family or friends, let your dog get acquainted with the new grounds outdoors by allowing him to sniff and mark. When your pal relieves himself outdoors, reinforce the good behavior with the command you’ve established during training. On future occasions, your dog will realize these are his new stomping grounds for the time being. While you may think your dog is housebroken, it is normal to have to do some rework of training in new environments. 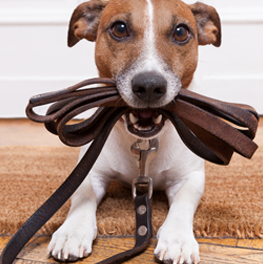 At home, your dog knows which door or outlets allow them to make their way outside for a potty break. 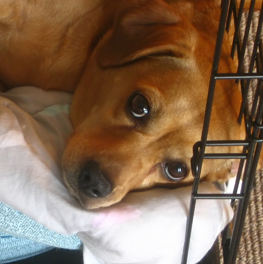 Away from home, your pup may be less sure of how to alert you that he needs to go, or which door he should signal to. It’s easy to mistake your dog’s need to use the restroom for anxiousness in an unfamiliar place. Being aware of different cues or behavior can also be tricky when you’re distracted. Don’t expect your pal to know how to “ask” in new places or even be able to find suitable spots to relieve himself until you’ve been there for a few days. Accidents are bound to happen, so packing training pads is essential for avoiding carpet stains and unpleasant messes if your pup isn’t picking up the proper cues fast enough. And while many owners would love to train their dogs to go outside, those with apartment dwelling pets, senior dogs or limited access to the outdoors will need an indoor option. 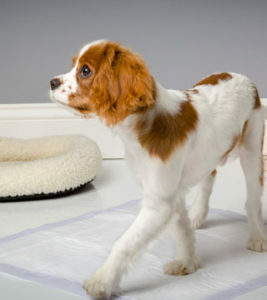 Dog pads are a great travel solution for pups who aren’t aware that the rules about using the restroom apply anywhere indoors. 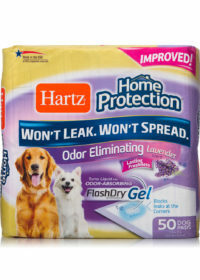 Hartz® Home Protection™ dog pads make clean up simpler, replacement and disposal easy, plus protect flooring. 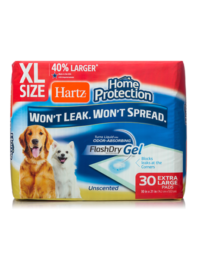 Designed with 6 layers containing Flash-Dry ® technology, Home Protection™ instantly turns urine into gel to reduce tracking, making clean up a breeze. A water-proof plastic backing and borders ensure our pads won’t leak, and each pad creates a smaller urine spot to allow for multiple uses. 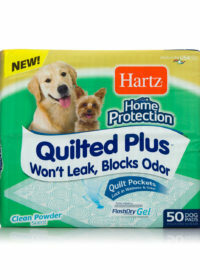 The special odor harmonizing capability within all Hartz dog training pads eliminates stinky smells left behind, turning eww to phew. If your house-trained dog is having accidents away from home (or if you fear he might), consider adding trainings pads to your packing list so you feel confident that you are ready for your trip. So buckle up and hit the road!